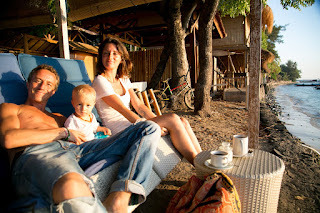 My little family & I recently spent 4 days on the Gili Islands to celebrate my 40th Birthday (23rd May). These 3 islands off the coast of Lombok are very small and have no cars or motorbikes...only bicycles & horse drawn carts. My kind of place! Here you can see the three of us catching the sunrise together. The energy of my experience there was still so strong upon my return to 'home' in Bali, I simply had to sit down and edit my footage and feelings into a short film immediately. And this is the result. After making this film I remembered how much I want to help others learn about the Law of Attraction. So, I have now updated the how to travel the world forever like us page and my firm intention is that my focused energy here will help others achieve their dreams.